The Danish National Association founded August 20th 1962. The National Association gathered many small groups in towns all over the country. All former KZ prisoners who had been linked to the Neuengamme Camp could become a member. The purpose of the association was to collect – process – distribute the historical facts about the KZ camp Neuengamme and its satellite camps. Anyone related to the Neuengamme camp and it´s outcommunities could become a member. In addition, widows, and descendants, as well as others with an interest in the association, could become a member. The association drove pilgrimages to outbacks as Versen and Dalum, where many Danes were situated during 1944-45. After cranes the trip was continued with visits to Esterwegen and Neuengamme. Every year the 1st weekend in september. Since 1996, the association has visited many other offenders throughout Germany, where wreaths have been added and every year there was a visit to Neuengamme to make a wreath there. 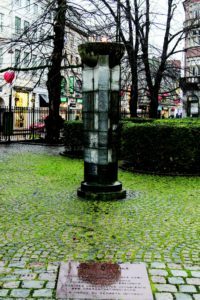 The association is gathered annually on April 20th at Holy Spirit Church in Copenhagen. The pillar is a memorial to KZ prisoners who died in German KZ camps. The memorial was revealed in 1950 and an arch of ashes from the Crematorium Square in Neuengamme. In 1953 an urn with ash from Auschwitz was digged. 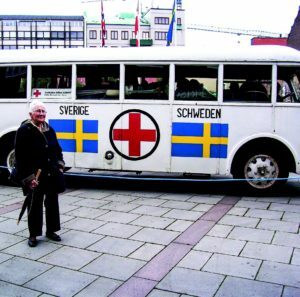 On April 20th Denmark became The Day of Liberation, as it is the date when the last Hvide Busser drove the last Nordic KZ prisoners away from the Neuengamme Camp. 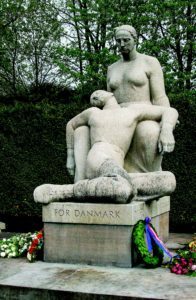 The Danish Neuengamme Association has been a member of AIN all the years.